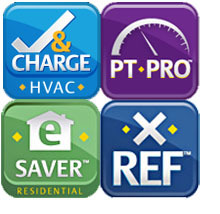 There are many useful mobile applications for HVACR contractors working in the field. Most of these apps are free and work on different smart phones such as Android™, iPhone®, and BlackBerry®. The Emerson PT Pro™ mobile app is an especially useful one that Emerson recently upgraded. Instead of looking for your pocket pressure/temperature chart, pull up this free app next time you are checking superheat. Simply select a refrigerant and enter a temperature (in C or F) and see what the saturated pressure (in Bar or Psig) is. You can also enter a pressure and see what the saturated temperature is for that pressure. The refrigerants included right now include R410A, R404A, R507A, R600 (butane), R717 (ammonia), R744 (CO2), R407F, R407A/C (liquid or vapor), R290 (propane), R134a, R22, and R12, just to name a few. For example, let’s say that you have frost on the suction service valve of a Copeland Discus™ compressor that is running low temperature R404A. Your customer is concerned that liquid refrigerant is coming back to the compressor and causing damage. You can explain to him that frost on the suction line of a low temperature refrigeration system does not necessarily indicate floodback – it simply means that the suction temperature is below 32° F. But you want to check the superheat just to be sure. The temperature of the suction line a foot from the compressor is 20° F. The refrigerant pressure is 30 psig. Use the Emerson PT Pro app to convert this pressure to its corresponding temperature. In the app, first select the refrigerant. Put your finger on the picture of the refrigerant tank at the bottom and slide right until you get to R404A. Then in the left top box enter “30” and make sure it says “psig”. The corresponding temperature shows -2.7° F. Since the actual temperature is 20° F, we have 20-(-2.7) = 22.7 ° F of superheat. Good superheat at the compressor; no floodback. Search “HVAC” in your preferred app store to find all sorts of useful free apps. Let us know how you have been able to put them to daily use. Your feedback will help us to improve our existing apps and think of new apps to add to your toolbox. Excellent post & thanks for the heads up on these apps! An app that lists all running load amp & locked rotor amp ratings based on compressor model numbers would be great! An app that discloses gas types based on compressor model would be wonderful. Often in the field units are not properly marked as to which gas the system runs on. Nameplate stickers fade after exposure to the elements. Stay tuned, your recommendations are being addressed in the next version of X-REF (March) and Copeland Mobile (Fall 2013). Emerson Climate has another app that is really useful to me in the field. It is call HVAC Check & Charge (I use the iPhone but I think it is also available on Android). It is fairly new and they call it an “Instant mobile refrigerant charge calculator for HVACR applications”. It reminds me of the old sliding cardboard charge calculators for quickly calculating correct system refrigerant charge for R-22 or R-410A based on subcooling, superheat, or airflow. TheNEWS did a nice article “Using the P-T Chart to Diagnose Refrigeration, A/C System Problems”. They used R-134a as an example. You can use the Emerson app in place of a P-T card, of course. I would like the apps for superheat cal. The links to download Emerson PTPro for iOS, Android or Blackberry are here – http://www.emersonclimate.com/en-us/Resources/Mobile_Apps/Pages/emerson_ptpro.aspx.